Good day and happy Monday! Halloween might be over but it's always a good time to read some creepy and scary stories. 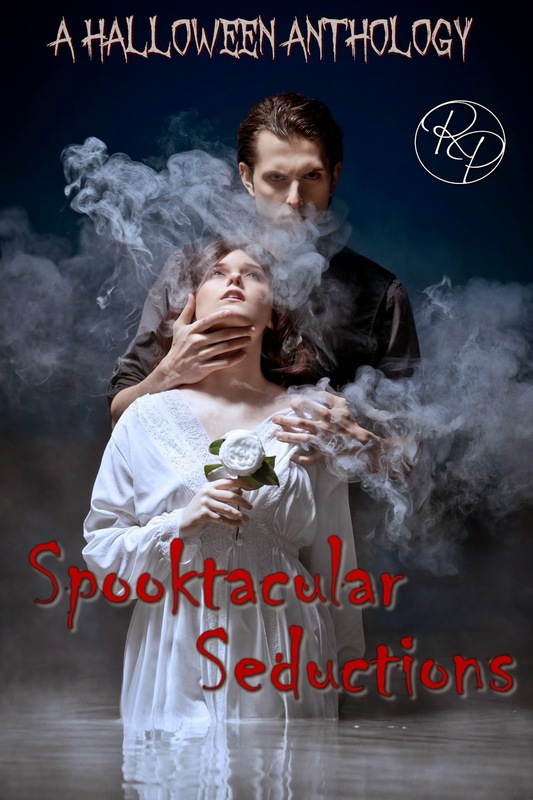 We bring to you today an anthology of paranormal romance short stories, Spooktacular Seductions, published by Roane Publishing. Reader Girls asked the authors what their favorite scary movie is. Their answers are below. Read on to find out what each individual story is about and enter the tour-wide giveaway. Have a great day! Fiona Mikolas is an outcast, branded by her fiery red hair and a purple birth mark—both signs of the devil. Two years earlier, she survived an influenza outbreak that claimed her peddler husband, Gregos, and her baby son, Tito. Now she lives a solitary life, traveling a circuit of southern states in America and selling healing potions. Until the night of All Hallow’s Eve, when her lonely life is changed by the arrival of two strangers in her camp. Something, or someone, pulled Miranda to purchase the old carriage house. It was a great deal, most likely because of the cemetery or the unexpected resident, Thomas. The ghost she finds within the sanctuary of her new home should have scared her. Instead she finds herself falling in love with him. After years of having her college boyfriend Sean as an ex with benefits, Julie believes he is finally, irrevocably out of her life. Forever. And it breaks her heart. Jeff Austin-LeGrange has been fleeing from the remnants of his dark and haunted childhood his entire life. The past always catches up to us, and his is no exception. Spending Friday night in an abandoned amusement park sounded like an awesome idea to motherless, teenage track star, Remy Bordeaux—empty rides with no queues, and time alone with his best friend’s alluring sister, Rafaela, was sure to make for a memorable night. Loralei takes extreme measures to prove her cheating husband has forsaken their bows by seeking confirmation from a fortune-teller. The truth revealed is that she’s been unfaithful in a six hundred year old spiritual marriage. Aggie Pierce owns a quaint little spot, the Spooky Hollow Cafe'. Tourist come from all over the nation to her confections diner for the entertainment. Real live interacting ghosts make appearances once a day, you just don't know when. I read The Exorcist (only in the daylight hours) and saw the movie afterwards and was deliciously scared both times. I have to admit my younger self was braver. Once I had a child, I couldn’t watch that genre of movies because I kept thinking, what if that happened to my son? The ‘spookiest’ book (not my favorite) was Stephen King’s ‘It’. I was cursed by so many nightmares when I read that story, I admit I couldn’t finish it. I don’t recall ever failing to finish a book other than this one. The spookiest movie was an episode of Twilight Zone called ‘Living Doll’. The idea of an inanimate object having an evil consciousness and the ability to move and do things were absolutely horrifying. Two books instantly come to mind from my teen years that I devoured and re-read many times: The Immortal by Christopher Pike because it fuses the world of ancient Greece with the world of two girls on vacation in Greece in the 90’s and I’m a sucker for mythology, and The Sleepwalker by R.L. Stine because the cover is imprinted on my brain and I was slightly terrified by the idea of waking up outside in a nightdress. Loved teen thrillers from the 90’s all around. As for movies, I was terrified by both ‘Vacancy’ (2007) and ‘The Strangers’ (2008) and really loved the premise on ‘The Village’ (2004). Goodness this is tough. Does Hocus Pocus count as a spooky movie? If not, let’s go with Maybe This Time by Jennifer Cruise for book and The Others for movie. I love Maybe this Time because it can creep you out and make you laugh, and it has a great romance. It’s right up my alley on ghosts. The Others is creepy because of its twist. I won’t give you a spoiler, but you feel for the characters. Mostly you feel worried they are being haunted. Paranorman. I loved the graphics, the voice acting, but overall the twist it made to the genre with good humor and fast-paced plot. I still get a bit teary-eyed toward the end. Even though it is creepy, it is also encouraging and hopeful overall. I've always loved R.L. Stine's "Goosebumps" series, but my favorite and most scary, was "A Night in Terror Tower". I remember reading this book in bed, the room darkened except for my book light. The reason this book stood out with me is because unlike most of his books **Spoiler Alert** the children never got out. My absolute favorite “spooky” movie is Jeepers Creepers. We watch it ever Halloween. And truthfully, it took me about four years to even make it through the entire movie. Now, of course I love it. And still get creeped out by it! My favorite spooky movie is Night of the Living Dead, because it’s campy more than really scary or gory. Plus, it was filmed in Evans City, Pennsylvania, not far from where I grew up, so it’s a hometown favorite. Psycho is a close second. Wuthering Heights by Emily Bronte is my favorite “spooky” book, even if it really is a romance. Bronte conjures such an atmospheric setting. What Michelle said... :) Thanks for the questions, too. I wish I could remember the name of my favorite scary movie. It was a ghost story and I saw it two or three times, but then it just disappeared and I never remembered the name. It was a very cool, supposedly true story. "Haunting of..." I still can't remember if that's even right. :) Thanks again for showcasing "Spooktacular Seductions." Thanks for hosting us Reader Girls. It seems odd that I wrote for the Halloween Anthology, but I don't do scary. My scary movie selection came from one I watched two decades ago. The few scary movies I watch now I wait until I'm in a comedic mood where I can laugh when the insane lunatic goes after the teenagers with the chainsaw.